After waiting for what seems like forever for the Guerlain Midnight Butterfly collection to arrive on Malaysian shores, I have finally sneaked a peek at the collection. Part of it anyway. I was at Metrojaya at Midvalley Megamall and did not see the Christmas collection displayed so I asked the girl at the counter who immediately brought out all the stuff for me to view. Apparently, there was no space for her to display the new products! Strange reason, but there you go! Bit of a waste really because most people would stop and stare at the beauty of the Guerlain Midnight Butterfly collection. The whole Midnight Butterfly collection is done in a pale lilac shade which is quite unusual and very pretty. Butterflies are etched on the surface of the metal case of the lipstick. However, I was disappointed to note that the Meteorites Pearls come in a cardboard box albeit with a butterfly embossed on the cover. It was a bit of a let down. 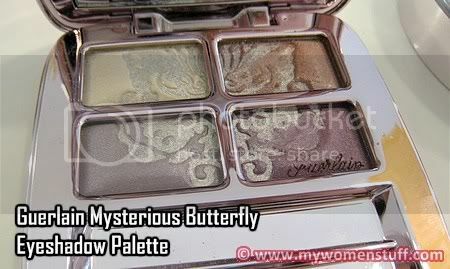 First up is the Mysterious Butterfly eyeshadow palette (RM180). 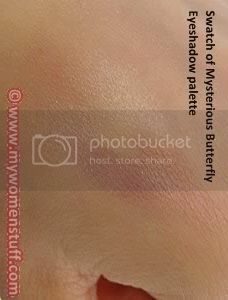 This limited edition eyeshadow palette comes in shades of purple with a butterfly etched on it and filled with shimmer. At a glance, I knew it wouldn’t work for me. I’m not overly fussed with sheer eyeshadows, but even I found these a little too sheer for my tastes. The colours themselves have shimmer but minimal and I suppose if you swatch part of the butterfly design then there would be more shimmer. I really like the Perles d’argent eyeshadow palette and to me, the Mysterious Butterfly palette can’t hold a candle to that. Pity really because it is seriously pretty! 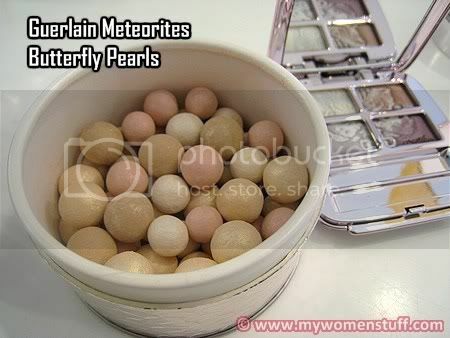 The second item I looked at were the Meteorites Butterfly Pearls (RM200). As I have said earlier, the meteorites come in a cardboard box with the same metallic lilac paper covering it, embossed with a butterfly on the cover. I felt it made it look cheap rather than elegant. The pearls are beige with light pink which give a fine illuminating effect on the skin. I like the loose Meteorites pearls but I prefer the highlighting ones that come in multi colours for slight colour correction. I did not see the pressed version that has the butterflies embossed on it. There are 2 Guerlain KissKiss lipsticks and 2 KissKiss lipglosses in the Midnight Butterfly collection. 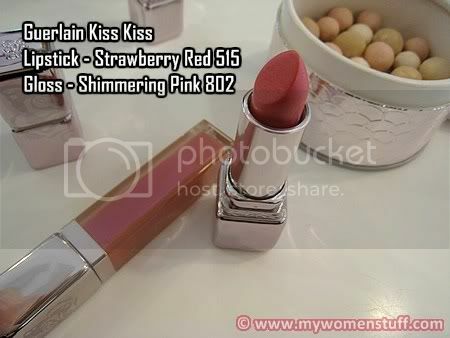 The Kisskiss Lipsticks are Strawberry Red 515 and a white colour (RM95). The lip glosses are Shimmering Pink 802 and Shimmering Violet 803 (RM82). I don’t quite know how to deal with a white lipstick. I suppose you can use it to tone down darker lip shades? I’m not quite sure. The Strawberry Red Kiss Kiss lipstick however was really lovely! It was surprisingly on the matt side but the colour which bordered on a light coral was gorgeous. I was so close to getting it. The colouring in the picture is slightly off but it gives a rough approximation. I have always loved the Kiss Kiss lipglosses. They are about the only lipglosses I really like but I had not tried the new formula. I was surprised that the Shimmering Pink 802 was not pink as per its name, but rather a light coral shade with high gloss factor. Shimmering Violet 803 was sheer on application but I felt it was too dark. It might suit someone with a darker skin tone or someone who likes dark purply lipstick. I don’t because I feel too gothic in dark lip colours. There is also a Le 2 Mascara in violet in this collection. I’ve only tried black mascara and really, the le 2 Mascara is quite nice to use once you get the hang of it. The Guerlain Midnight Collection 2008 for the holiday season can be found at all Guerlain counters and are limited edition. i see the pearl balls elsewhere, but i am so…shy to ask, how to use them? just use brush to pick up the color? or rub the ball on the face? @prettybeautiful : No one’s going to laugh at you 🙂 Its a powder so use a fluffy brush, brush over the pearls and apply on your face. I’ve written about it in my Guerlain Meteorites Review. Hope that helps. Thanks for the review Paris! The palette is very sheer indeed!! Such a pity though… cuz the palette is really pretty!! Thanks for the review. The palette is so pretty, it is a pity it is soo sheer!! What? The box for the loose powder is made of cardboard? I though it was a metal case. Haha. I guess pictures can fool you. @geekchic: Now I know what you meant! @gio : Yep, its one to look at for sure. Still, I’m sure there are girls out there who like it. Did you see the mascara as well? Its nothing special though other than the purple case. I’m surprised you didn’t see the pressed butterflies powder but then again it is super expensive! Still, according to the SA its already sold out in many places over here. @blu3 : Yes I can see the butterfly rubbing off already in the tester. Still, can’t deny its pretty eh? I saw the mascara and I agree with you about it being nothing special. As for the pressed butterflies, perhaps its too expensive to bring in 🙂 Glad you eventually got it! @Tine : You said it! But the lip stuff were gorgeous! I wasn’t too keen on the new collection at Guerlain too, as I never liked eyeshadows that were too “sheen,” and metallic-like. It would of been a definate thumbs up if the eyeshadows had a slight shimmer. I wasn’t too impressed with the meteorite butterfly pearls, as their meteorite luminating pearl range gave much better results. Anyway, keep going with the reviews! I’ll be back to check out more updates. Hope you’re having a lovely weekend. I was hoping you could do Laura Mercier holiday 2008 edition and Cherries Noir as well… the lip velvet sounds enticing! @Dian : I’ll try to get round to it if I have the time. Thanks for the suggestion.